recommended products link to Amazon page here: Note: below are affiliate links, by clicking on them Sprocket may receive a small commission. Crash Mat - First of all, it's bigger than it looks in the picture. It's 5 x 5 and arrives vacuum sealed in a box - it's really cool to watch it expand when you ﻿unwrap it! This crash pad﻿ is awesome and I would definitely say get the cover with it. Not only is it super easy to zip on and off and to wash but it makes the crash pad double as a sort of "blob" because it traps air in it and bounces the kid if someone else jumps on it at the same time! This is one our favorite pieces of equipment and will save your couches and cushions from being turned into their own makeshift crash pad at home. Airwalker Swing - If you only buy one swing for your sensory needs at home this is the one you want. It's by far the most versatile and is big enough for a big grown up too. It's really sturdy and it comes with the spinner hardware so it spins really smoothly (that's why it's so expensive). It's worth it! We've got the regular sized one in our clinic and I LOVE using it for myself between sessions - it's like a secret hideout! Oh and it's washing machine friendly. If you could only get one piece of equipment for your kids this should be it. 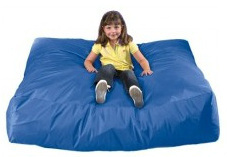 You can sit on it, lie on it, have sword fight games with it, bounce on it, roll over it, roll under it . . . It helps to improve balance, coordination, visual tracking skills, core strength . . . I could go on and on. We use them in all different sizes at Sprocket and they really are so awesome. Oh and if you get a big enough one, a grown up can sit on the back of it behind a child to work on tasks hand over hand if needed or just for support. For your reference : the 50x100cm ball is big enough for grown ups and big kids, the 30x60 size ball is a great size for babies and toddlers and small preschool children. These have been around for years, and they never get old! This link is to the adult size hopper ball, which is harder to find. We have two in the clinic and use them ALOT. They're really durable and hold well over 250 lbs easily! They're great to work on improving endurance, STNR reflex integration and overall gross motor coordination and timing. Juggling Sticks are so much fun! They're great entertainment for the whole family and are great to work on bilateral coordination and timing of movements. Once you start playing with them you won't want to stop - they're addicting!! Search "juggling sticks" on amazon and you will find plenty of options for purchase! Check out all the cool moves you can do with this toy! We like to call them Sticky Bubbles here at Sprocket. They are exactly what they sound like! You can catch them and they won't pop right away. They're a great tool for body awareness, visual tracking and tactile input. Search for Touchable Bubbles on Amazon to find dozens of options for purchase. Squiggle Wiggle Writer (aka - Shaky Pen)- It's a pen and vibration toy in one! You can remove then pen tip to use it for vibration only if desired! It's a great fine motor tool and makes a tremendous difference for those kids who experience "writing anxiety" due to any number of reasons. It makes writing and drawing fun, especially for kids who don't usually like to write! Besides, you can buy 2 of them for 13.99 and all it needs is a single AA battery. 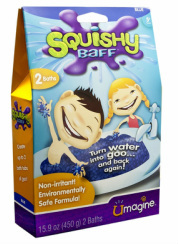 SQUISHY BAFF - TURNS WATER INTO GOO AND THEN BACK TO WATER AGAIN This stuff is so gross it's awesome!! It turns water into goo (like applesauce consistency) and then back again when you're done playing in it. It doesn't have a smell and comes in cool colors. You can use it in any size bin that holds water, I've done it in a clear shoebox bin and it works great! It's a fabulous sensory playtime activity!! You can hide all sorts of toys, letters, etc in it and make your kids try to find them. You can buy it at Walmart, order on ebay or on Amazon. These transparent water beads are so much fun to play with and are super inexpensive! They sell the brand name refill packs at Walmart, Target and Toys R Us. 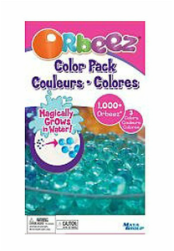 These water beads will keep your kids playing with them for days!! They're an experiment to watch grow (they take about 3-5 hours to reach their full size) and there are endless ways to play with them. These are an AWESOME SENSORY TOY and can be used both warm and cold. 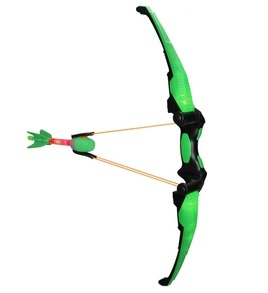 Zing makes a great quality bow and arrow for kids. The arrows are soft and have suction cups and even have ones that whistle when flying through the air. They are an outside or playroom toy only, for sure. There are so many potential uses for a bow and arrow toy and it works on so many different OT skills at the same time. It helps develop pinch strength, bilateral coordination, visual motor skills, scanning, visual fixation, and social skills - to mention a few. "Fun Little Suckers!" How can you not love playing with Squigz?! They're colorful suction cups that stick to any type of flat surface! They're portable, washable, durable, and appropriate for all ages. Ideas for use: Stick to floor and pull while lying on a scooter board, throw across room and try to stick on windows, put all of them on something flat and pull them all off as fast as you can - the POP they make is soooo satisfying! There are giant squigz and flexible/bendy squigz too. Yes, that's their real name. They're stretchy toggle laces and come in all sorts of colors. They're appropriate for all ages and easy to use. They make shoe tying a breeze!! Look up The Friendly Swede No Tie Shoelaces on Amazon to order!